Ajan Fakir, born Shah Miran, also known as Azan Pir, Hazrat Shah Miran, and Shah Milan (presumably from Miran), was a Sufi Syed, poet, Muslim preacher and saint from the 17th century who came from Baghdad to settle in the Sibsagar area of Assam in the north-eastern part of India, where he helped to unify the people of the Brahmaputravalley, and to reform, reinforce and stabilise Islam in the region of Assam. 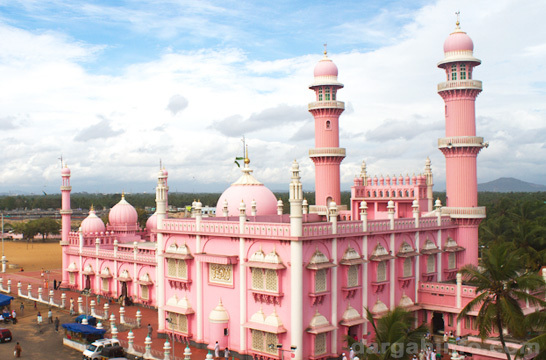 It is belived that he built a masjid at Sonpura, near the Ahom capital Gargaon and chanted 'Azan', the calling for 'Namaz' for which people called him Azan pir. Popular belief is that he and his companions came to India on foot and entered the country through the khaibor. He stayed at the Dargah of Hazrat khwaja Moinuddin Chisty (RA) at Ajmer. Then he came to Dargah of saint Hazrat Nizamuddin Auliya (RA) in Delhi. No historical evidence regarding his entrence in Assam is available; but popular belief is that he came to Hajo through Koch Behar. According to one version his name was "Hazrat Shah Syed Mainuddin". He is particularly known for his Zikir and Zari, two forms of devotional songs, that draw from local musical traditions and have striking similarities with borgeets of Srimanta Sankardeva, the 16th-century saint-scholar from Assam. In addition, Azan Fakir was a preacher with profound mastery over the Qur’an, the Hadith and Islamic philosophy. Ajan Fakir was a disciple of Khwaja Nizamuddin Auliya in Baghdad. He came to Assam accompanied by his brother Shah Navi. He married an Ahom woman of high social stature and settled at Gorgaon, near modern Sibsagar town. As a Pir he composed Zikirs (a type of spiritual song). Originally he spoke Arabic, but he completely mastered the language of the land he adopted, permitting comparison of his songs to those of his Vaishnava contemporaries. In course of time his influence spread, he acquired a good number of followers and earned the enmity of a Muslim official, Rupai Dadhora, who by conspiracy convinced the Ahom king that Ajan Fakir was a Mughal spy and had orders passed for plucking out the Pir’s eyes. The Pir, according to some songs, had two earthen pots brought into which he let his “two eyes drop”. The king was alarmed and for atonement made land grants to Ajan Fakir at Sovaguri Chapari, near Sibsagar and had a matha built for him. This place on the bank ofBrahmaputra has become a holy place with Ajan Pir’s Dargah where an annual urs is held. 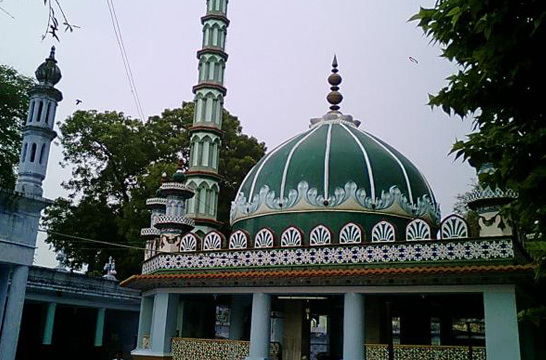 His dargah is at Sahaguri Chapari near Sibsagar town. Hazrat Ajan Pir never discriminated people on the basis of religion. He declared that he had no feeling of discrimination in his mind as a Hindu or a Muslim is the creation of the same Allah and every human being irrespective of religion radiates the glory of Allah. It is said that the dead "Suratree" under which Hazrat Azan Pir (RA) sang the glories of Allah came back to life luxuriantly.